Brussels, 28 November 2018 – During its third Annual Summit on 27 November in London, under the banner “Reaching the Summit of Consumer Trust”, the European Interactive Digital Advertising Alliance (EDAA) unveiled its plans to increase transparency measures and place consumer trust at the forefront of its efforts. Leaders from the advertising industry came together to address the lack of consumer trust and transparency in online advertising. EDAA, firmly established at the forefront of these efforts, outlined how self-regulatory tools can further promote and enhance industry best practise. Drawing on the success of the ubiquitous OBA icon, EDAA will reinforce real-time, contextual and meaningful information towards consumers as to how they can be empowered with choice and control. Through recognition and understanding, the EDAA is determined to bridge this trust gap by promoting greater consumer favourability through meaningful industry best practice. In parallel, consumer-facing education efforts will form a centrepiece of the organisations’ offering going forward, leveraging the self-regulatory tools including the Icon and the pan-European youronlinechoices.eu, which registered over 20 million visitors in 2017 alone. Angela Mills Wade, EDAA Chairman and Executive Director of the European Publishers Council, stated: “The EDAA offers a unique forum for all parts of the digital ad industry to come together to provide responsible B2C practices and tools with a proven track record in putting the consumer first. Advertisers, publishers, agencies and third parties are committed to ‘doing the right thing’ for consumers, putting them front and centre of our efforts as we develop the next phase of our transparency and accountability programme to address the lack of trust in how data is used for digital advertising. EDAA showcased its leadership in the field, outlining a principles- and standards-based vision of just how this can be achieved”. Through exceptional keynotes and panel discussions with 17 leading European and global speakers on business-critical topics, such as GDPR, ePrivacy and transparency, the 2018 Annual Summit provided practical signals on how companies can rise to the challenge and give pro-privacy practises a competitive edge. A panel on Putting the Consumer First, composed of representatives from across the advertising ecosystem, discussed what consumer trust means to them and how self-regulation, and in particular the EDAA Programme, is all about putting the consumer front and centre, providing real value to consumers and business alike. This year’s EDAA Annual Summit outlined how companies and consumers are still adapting to the General Data Protection Regulation, which came into effect in May 2018. Over 100 stakeholders attended this informative event, spanning trade associations, academia, ad tech and digital advertising businesses. Now more than ever, companies need to demonstrate a pronounced responsibility and rebuild consumer trust. The European Interactive Digital Advertising Alliance EDAA is responsible for the administration of the pan industry self-regulatory programme on Online Behavioural Advertising (OBA), enabling users, through the display of an icon, to access transparency and choice with regard to OBA. We are currently looking at the user’s online experience now that the GDPR is in place, and how we can improve this experience, and consequently user’s trust in the ecosystem. EDAA provides technical means for consumers to exercise transparency and control over OBA through the youronlinechoices.eu online consumer choice platform. More information can be found at www.edaa.eu. 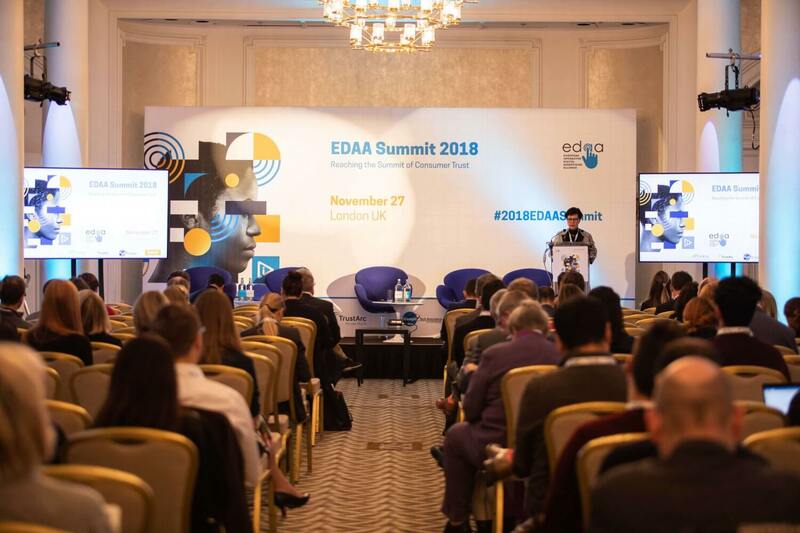 The EDAA Annual Summit, now in its third successive year, has become a staple calendar event within the privacy and advertising technology fields, and is known for provoking honest, open, intellectual and critical debate, covering broad viewpoints with the ultimate objective of building trust with consumers.